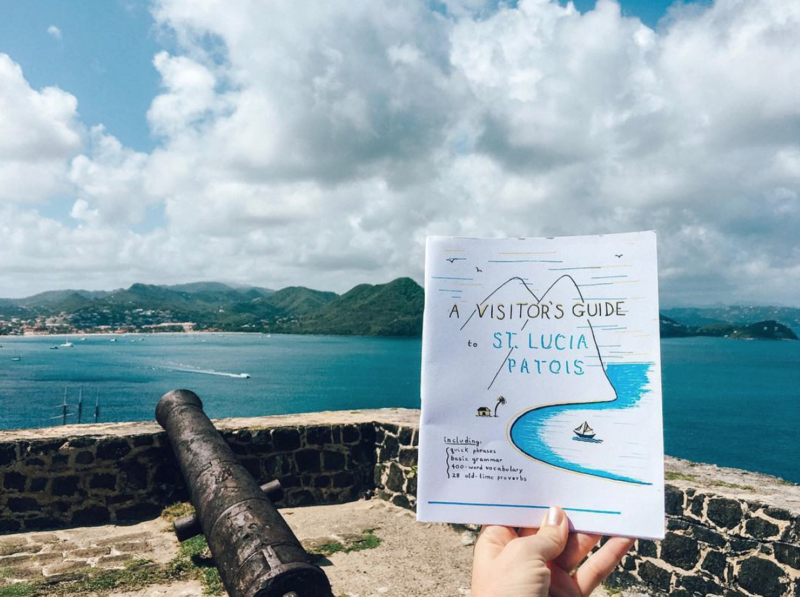 Anyone who likes street art will be happy to find that there’s a growing trail of local outdoor art to be found in Saint Lucia. 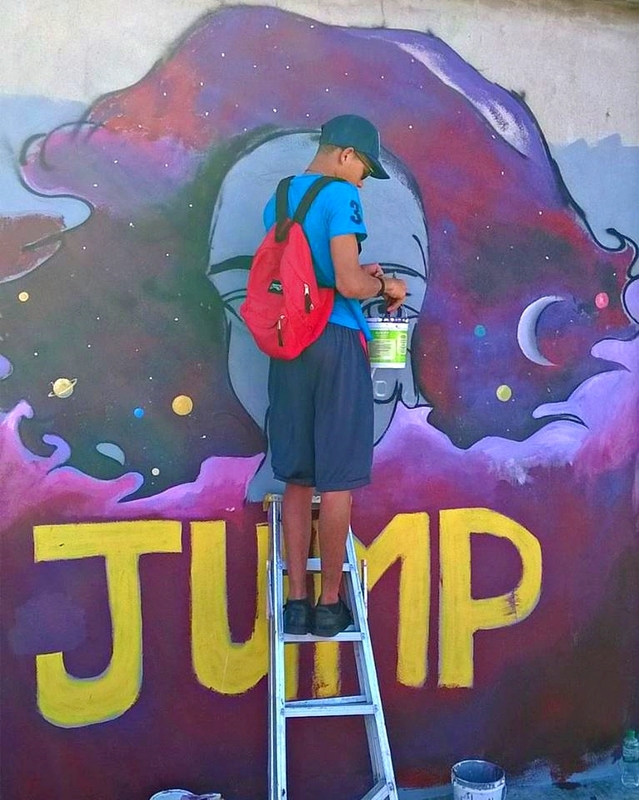 Young artist, teacher and community volunteer Naja Simeon is responsible for much of the recent additions, bringing youth expression to the walls of stadiums, restaurants and schools. Never too young to get involved! IE: So, how did it all start Naja? NS: It all started when I was doing a live-art portrait of Sherwinn ‘Dupes’ Brice for one of Dupes’ videos. We were talking about art and Dupes was telling me about how he used to see all kinds of art on all kinds of walls when he was traveling. Dupes was saying ‘We don’t even need a gallery to show our work, we can just put it on a wall. Alright, we’re gonna do an Outdoor Gallery.’ So the name just stuck. 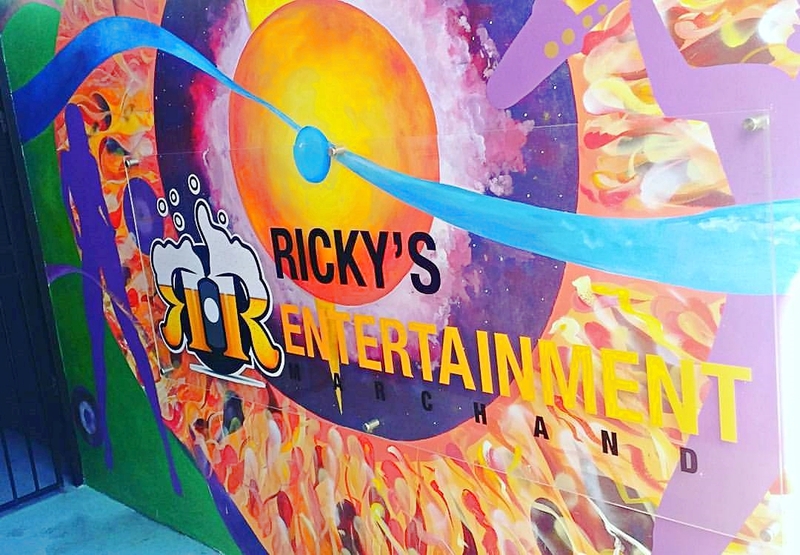 His Mum owns Shernel’s Pizza and she said ‘I have a wall and I have some paint, If y’all want we gonna paint, I’ll give y’all food, we’re gonna paint.’ So we teamed up with Rotaract South, I was a Past President and I do projects with them. 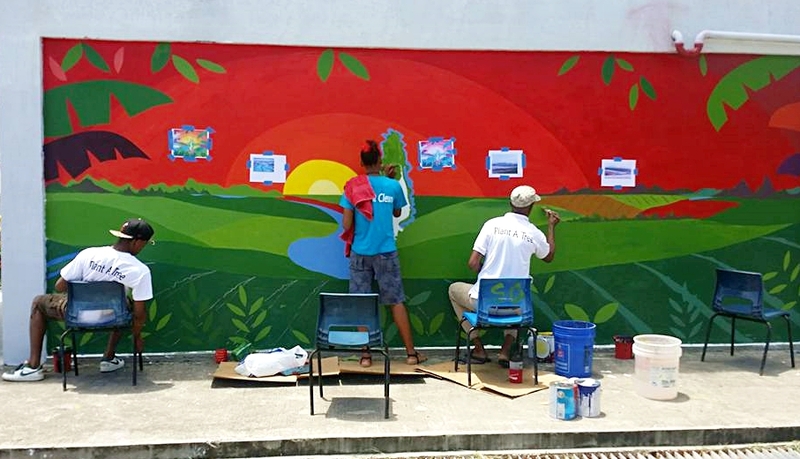 So Rotaract was there, Volunteer Saint Lucia was there, members of the Vieux Fort Youth Development staff were there, and we just attacked these walls and we painted. it spilled over to the Phillip Marcellin Ground. It spilled over to the walls outside Castries Compri. It spilled over to Ave Maria. And then it just keeps going and going. IE: So young people from the community help with those as well, was it a whole set of artists? NS: Yeah, I was like the lead artist, Dupes is the organizer, transporting people and paints and asking for donations and then we’d come up with these designs, taken from the youth themselves, there were young artists in there, they would be like ‘I have a design in mind’ and we said, ‘Well Let’s put it on the wall!’ So we just gave them that little push, and they go. And now, their work is on the wall. 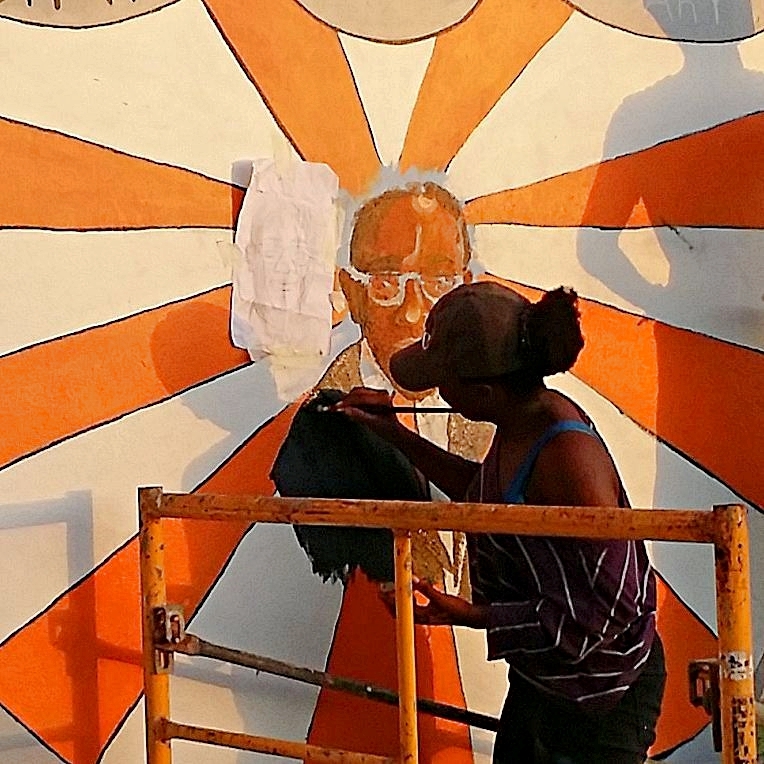 IE: And right now, roughly how many murals that you’ve been involved in, do you think there are around Saint Lucia? 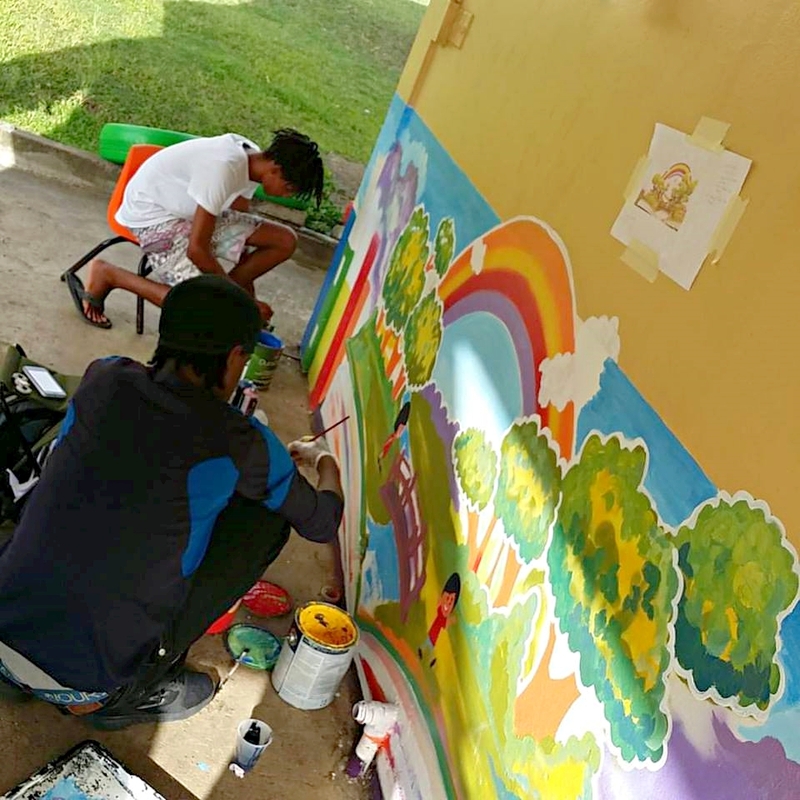 NS: Around Saint Lucia, alright, well in Vieux Fort alone we have about ten murals in Vieux Fort and I’m going to be painting another one next week. In Castries we have the three at Ave Maria, the wall opposite Castries Compri. 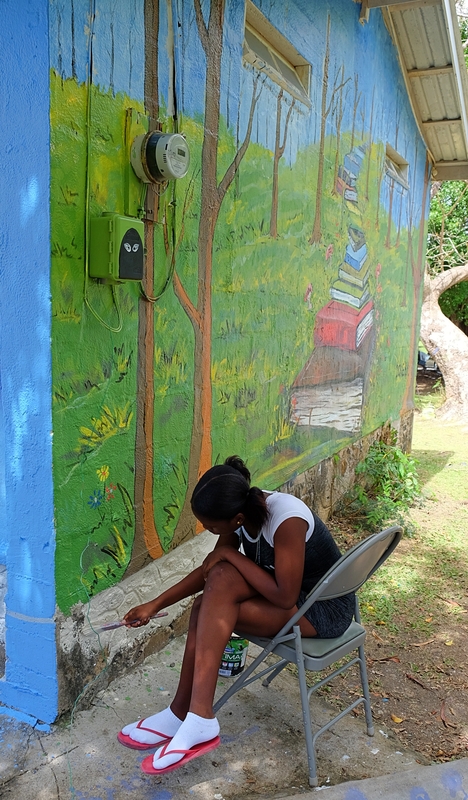 I did one at Gros Islet Primary school, it’s like three murals, three different walls, inside the Primary School. 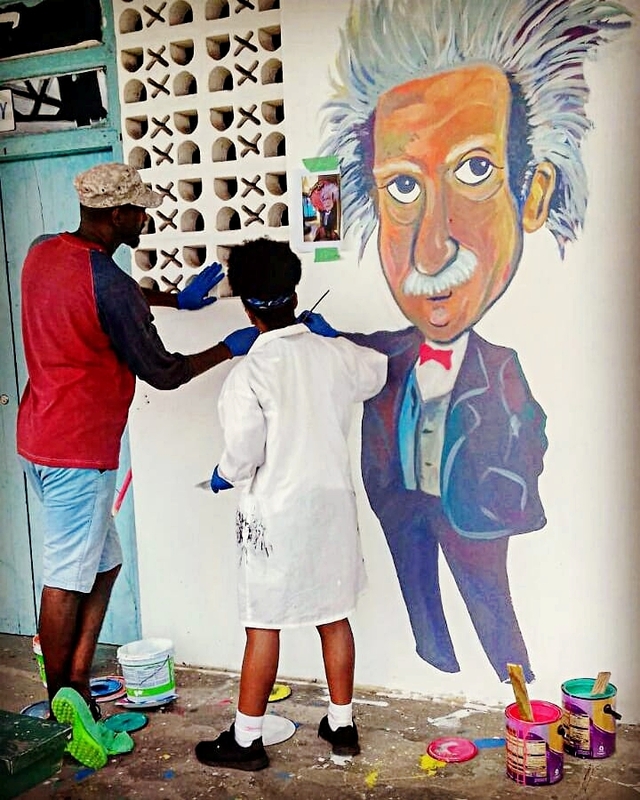 The Secondary School, I did a mural there…are you keeping count? IE: That’s a lot. 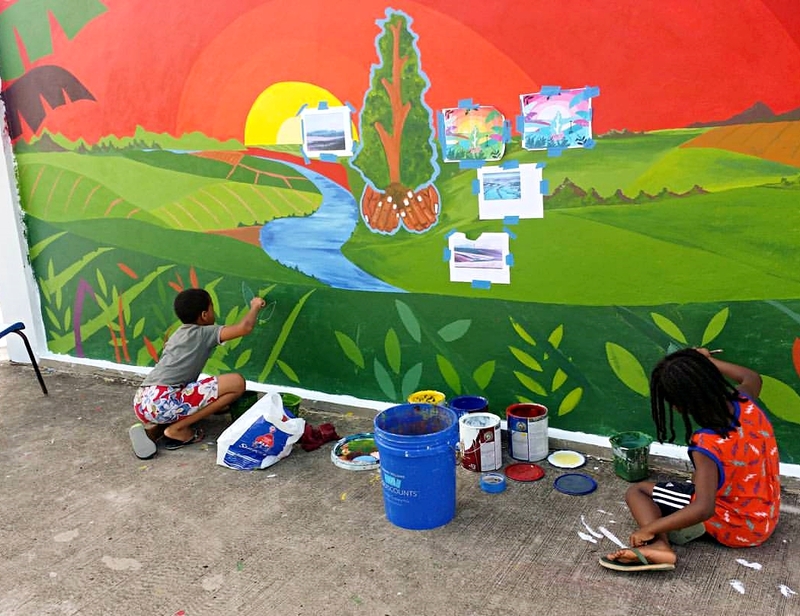 So definitely, anybody who’s interested in outdoor art could go around and see all these murals. NS: It’s definitely something we just started. I think the whole City needs it because the city is just kind of concrete. I think we need to bring back some of that Saint Lucia, simply beautiful, that whole idea that we selling back to the city. IE: I love the idea of the wings you just did in Monchy cos it makes me think of a carnival costume and the person can stand in the middle of that and take a photograph like they’re King or Queen of the band. IE: Who are Girls of a Feather? NS: They’re like a mentorship group, in Saint Lucia. 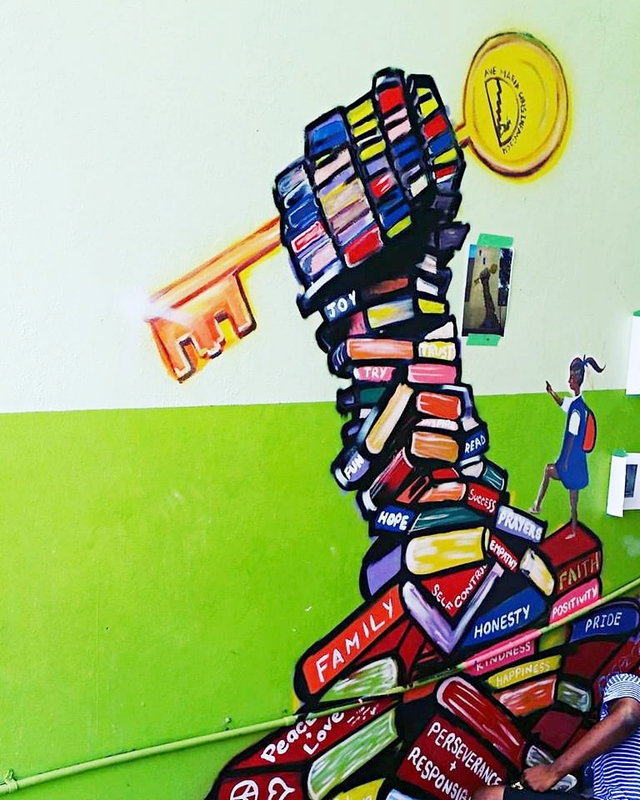 They wanted to paint some empowerment symbols with women at Ave Maria School. On one of them, there’s these arms (makes a muscle) so the children have to stand in-between them, so they look like they’re kinda strong. Just to lift up their spirit. So that idea of interactive murals where you become part of it and take a photo. IE: So where aside from this, are you going as an artist or is this your focus? 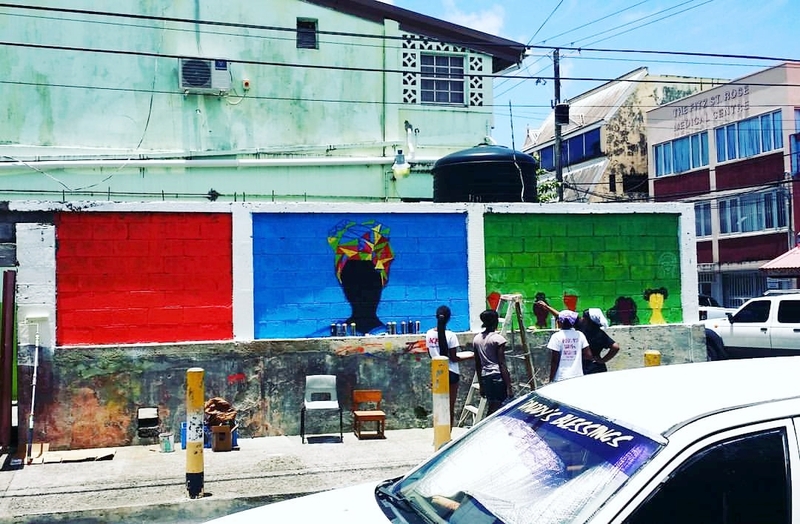 NS: Well I started doing these murals back at university where in the Arts Guild we were called on to do murals at different parts of the city, we were just offered the walls and told go do it. I was like the only one who jumped on it, who did it because everyone else wanted to get paid. But it gave me a lot of experience and definitely this has opened a lot of doors. 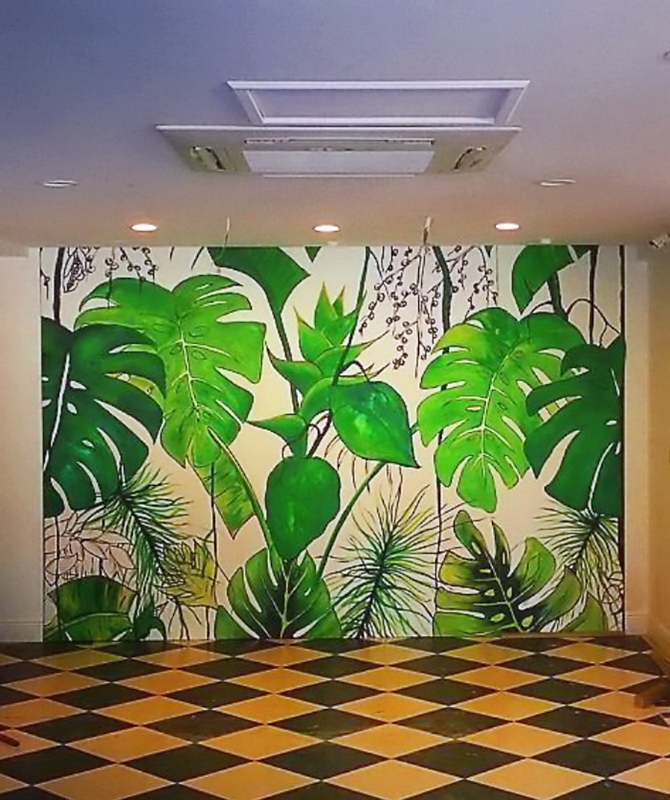 People who see me painting stop and ask me to do work, in their homes, in hotel lobbies. So it has opened up doors, but for me, the main reason I’m doing this is because of those so many empty walls. And there’s no-one else doing this in Saint Lucia. There’s no public art without it being something commissioned, costing thousands of dollars, which is stifling the movement. NS: As I always say, I’m just trying to put a little smoke in the air, you know, because where there’s smoke there’s fire. And there’s a lot of young people, and the appeal is there, because we’ve realised that wherever we’ve put a painting, even on a wall that’s been heavily graffitied before, once we go out and we put a painting, nobody interferes with it. They respect the art. Because the reason they put graffiti on the wall, is because it’s a canvas, but they don’t really have the skills, so they just write something, so we give them the skills to do more. 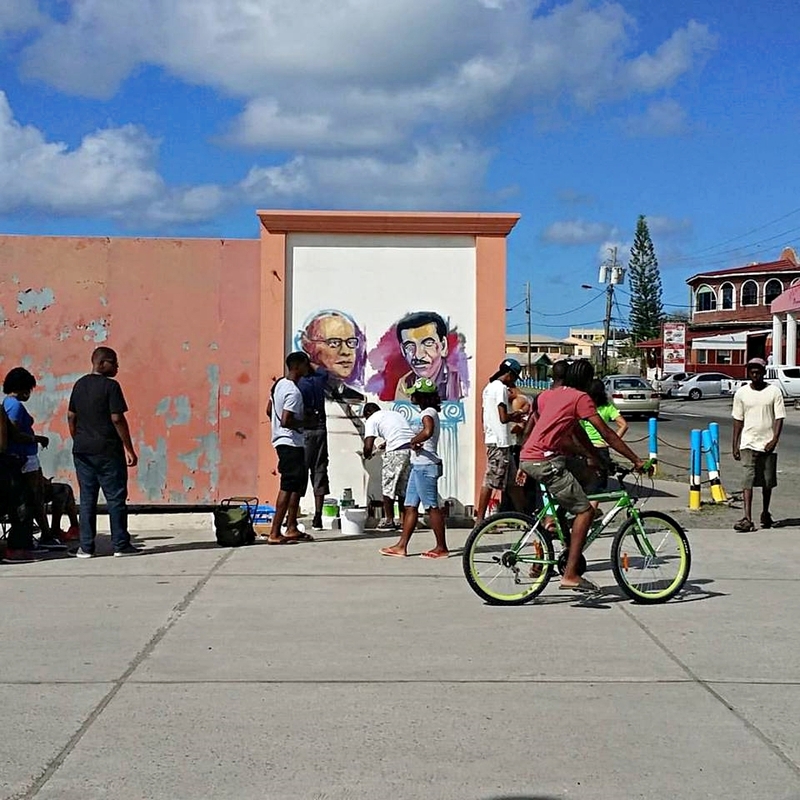 NS: Yeah, you know people arrive in Saint Lucia and leave the airport and go find the murals in Vieux Fort. 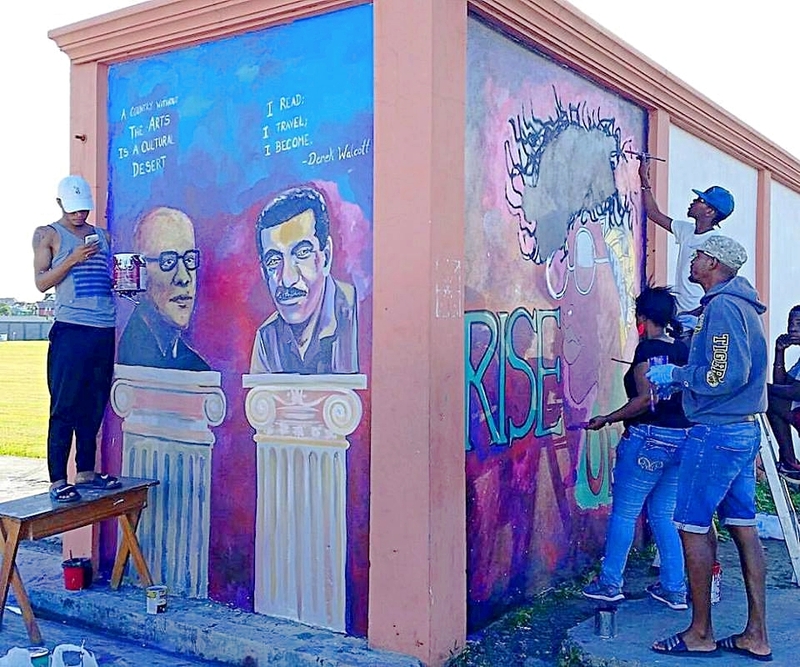 IE: Yeah like my niece and her friend, they virtually jumped out of the car while we were still moving when we were passing and they saw the murals in Vieux Fort! NS: And you’ve seen the size of those walls, right? And they’re just empty – they’re there for companies to advertise on, but we’re just asking permission to use them for art in the meantime. And you know actually, in France, they have banned ads in the city because you know, they call it ‘visual pollution’. It’s just marketing, marketing, marketing and there’s nothing substantial, nothing uplifting. IE: So, places like the multipurpose court, the SAB, that should have murals because it’s the purpose of the place, you know, uplifting the youth. I mean ok, if you have a wall in front of commercial property, you could say, ok, ads can be placed there, but other spaces, like in the city and everywhere, certain spaces should be reserved for public art and have that ongoing. IE: And there’s something really special about youth groups doing this kind of thing, they can then look and say ‘you see that bit? I did that’ and it’s there for everyone to see. 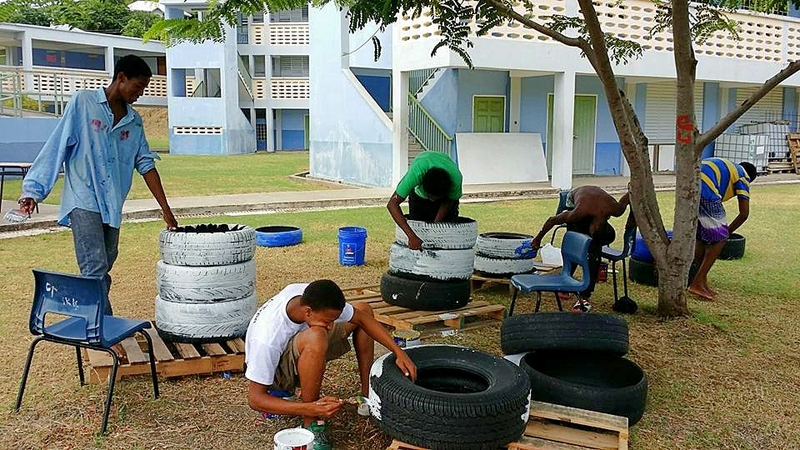 Part of what we’re putting on the website is causes, you know, so people who want to make a difference in Saint Lucia can support them, because this is all voluntary right? 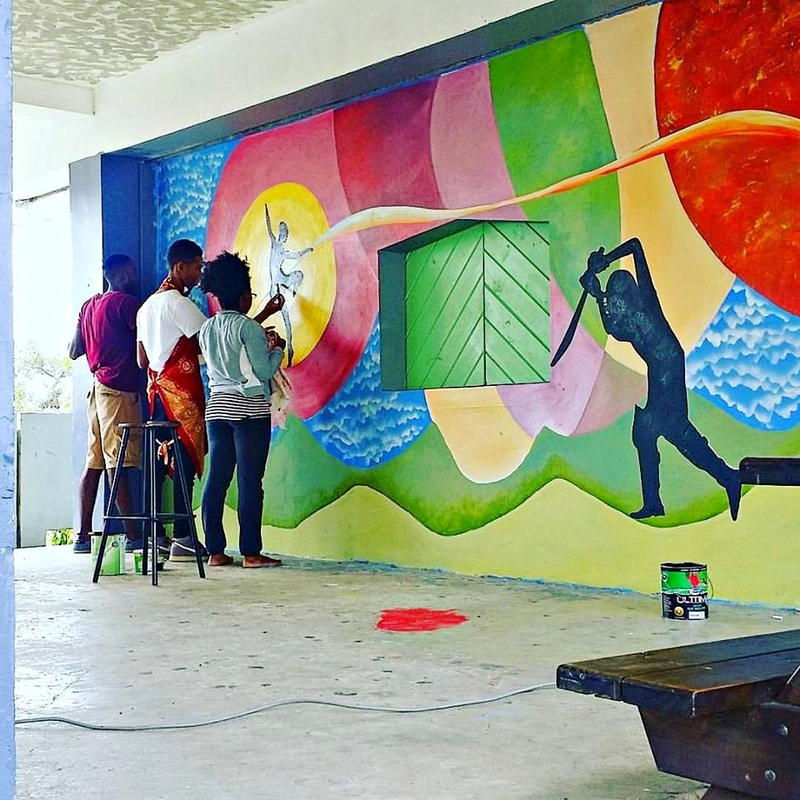 NS: Yeah, well I’ve committed to giving a community somewhere in Saint Lucia one mural each quarter of the year. I give my time, but the paints I use cost quite a bit so we try and raise funds for that…We try to use good quality paints so that the artwork will stay bright for a long time. I like to use a spray paint specially made for street art, but you know, we have to pay a lot of import duties for these paints, so that’s not always possible. 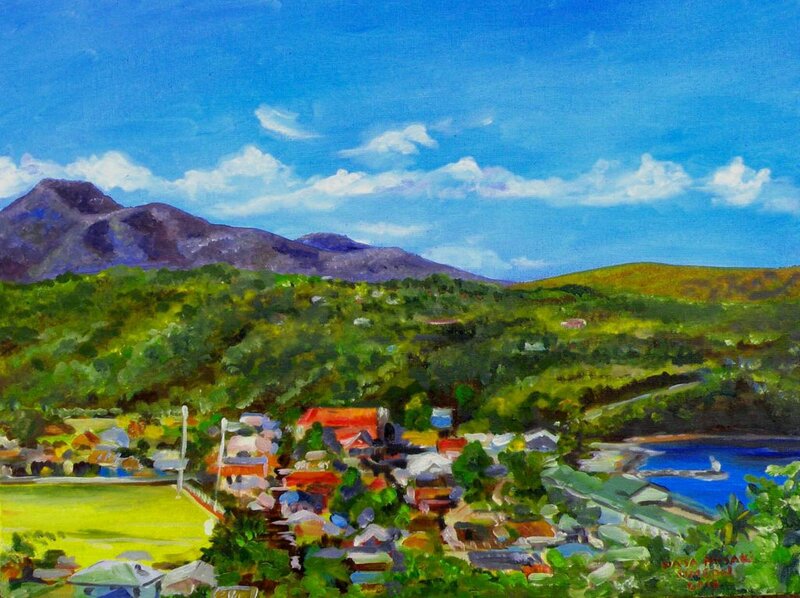 Naja Simeon is a young Saint Lucian artist hailing from the beautiful mountain community of Saltibus, Laborie in the south-east of the island. His art influences are broad and varied, from the great impressionist artists of the late 19th Century, to contemporary artists such as Jean Micheal Basquiat and Shepard Fairy. 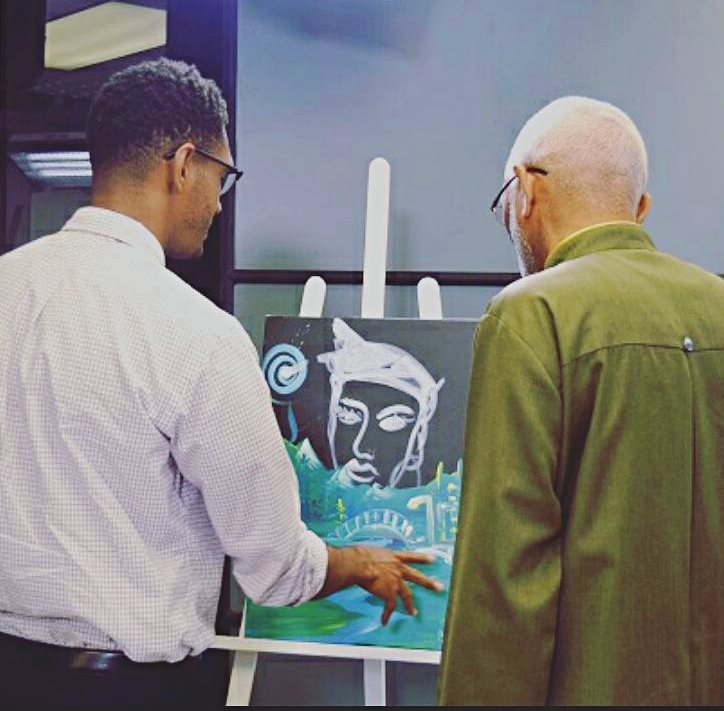 He has a passion for nature and the environment and a gift for inspiring young people to love art. 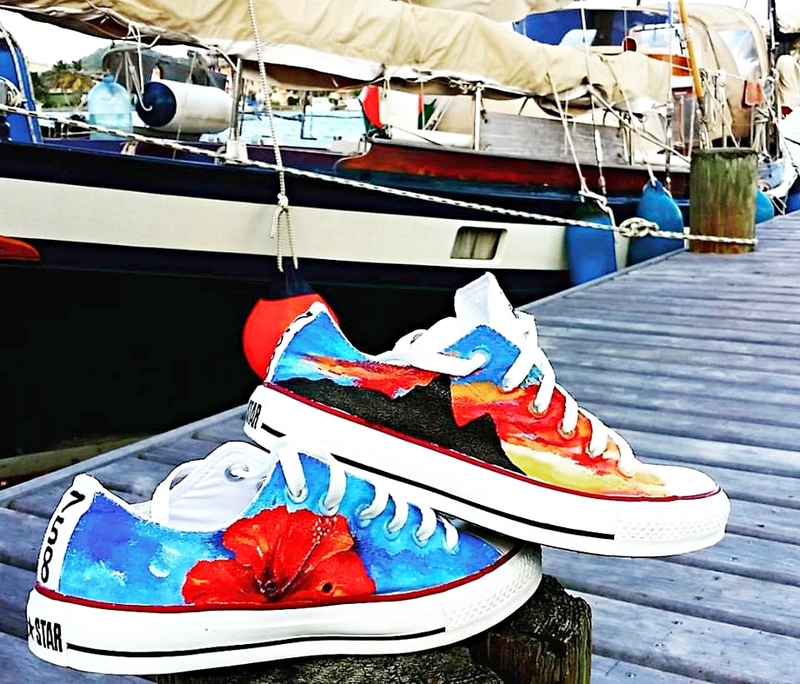 After studying art and engineering at Grambling State University he returned to Saint Lucia in 2013 and launched himself onto the local art scene with on-the-spot pencil portraits at local events. 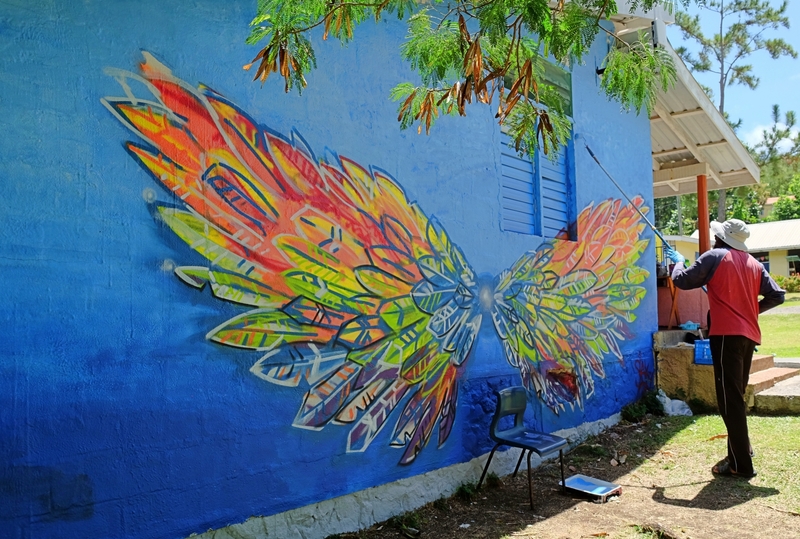 He was soon noticed by Island Mix Arts Emporium and asked to show his paintings and teach kids and adults. Naja won the Most Outstanding Youth of the Year in Arts Award at the National Youth Awards in both 2016 and 2017. 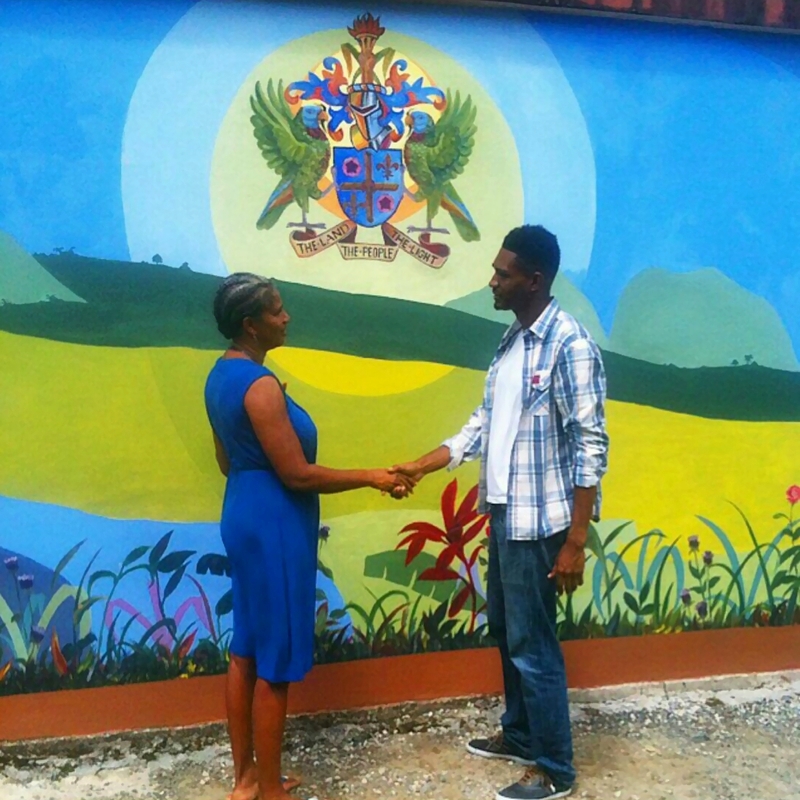 His day-job sees him as Head of the Creative Arts Department and Art teacher at Gros Islet Secondary School where murals he’s created with the students adorn walls, and art-room tables have become brightly painted canvasses. 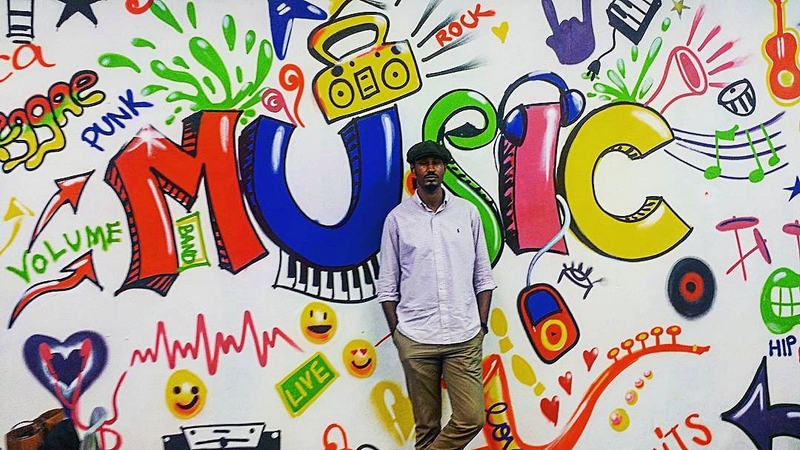 With a group of teacher friends, he works with Jump, a youth mentorship programme that encourages kids through arts, sports and academics, to be confident and serious about their lives. 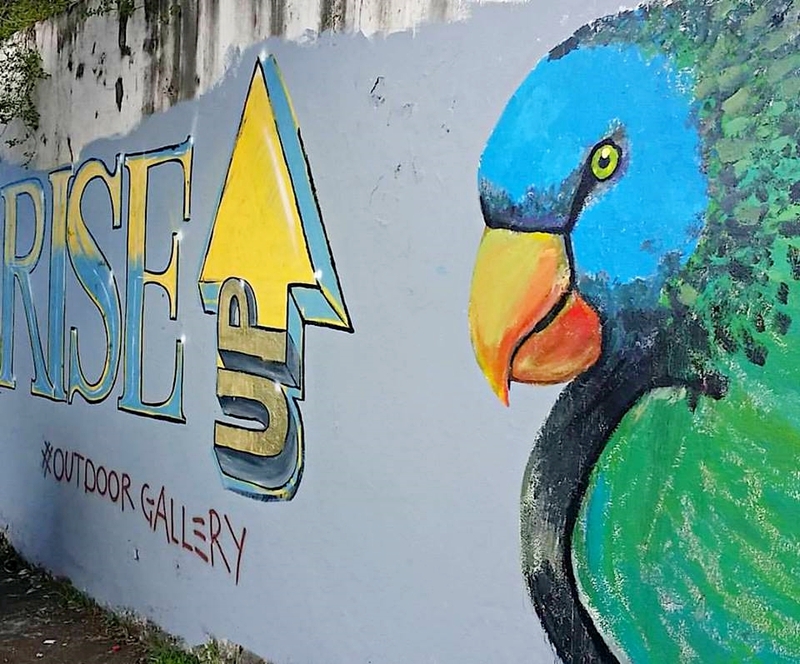 With several exhibitions in the US, UK, Trinidad and Saint Lucia under his belt, probably the best way to see his art while in Saint Lucia, aside from at Island Mix, is by seeking out some of the many murals in the Outdoor Art project around the island. 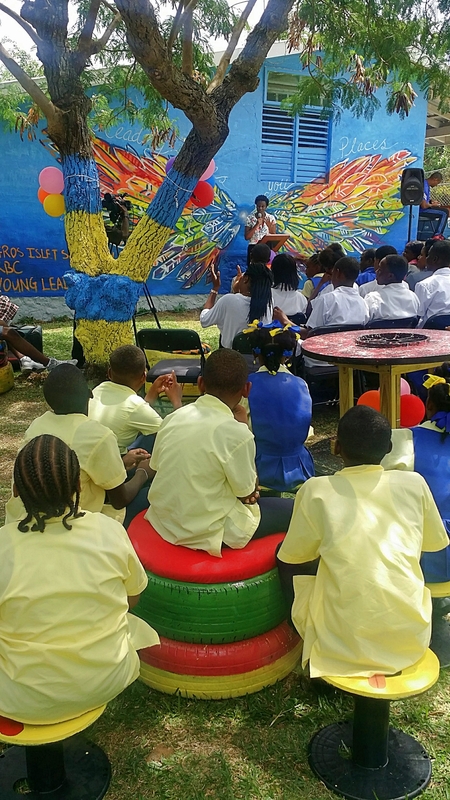 His latest community art murals can be found at the Monchy Primary School where he assisted young people and teachers to create an outdoor reading space for the 2018 Young Achievers Competition. 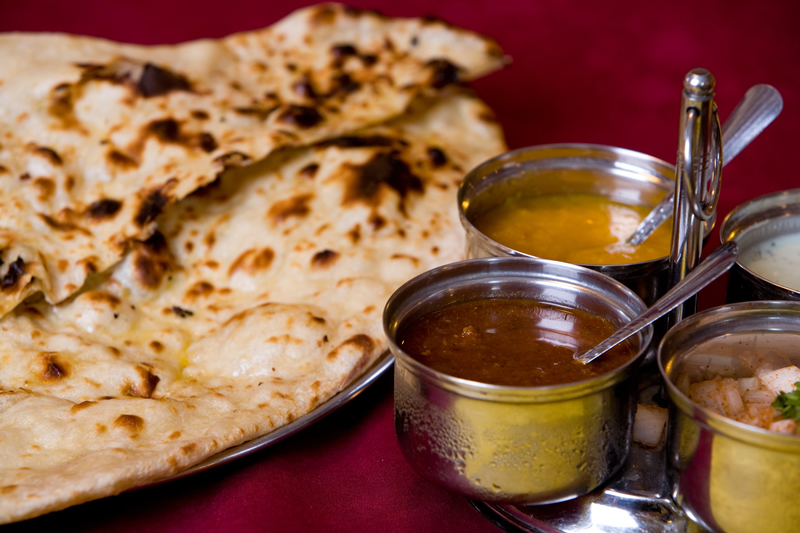 « Razmataz Tandoori Restaurant – delicious Nepalese Indian cuisine and the warmest of welcomes!